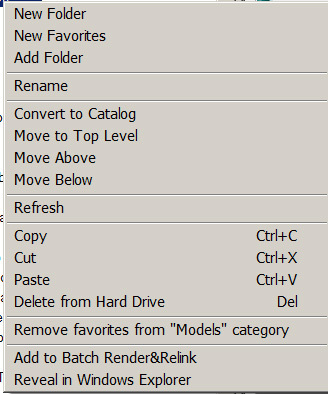 But now I would like to sort the ‘Favorites’ names according to alphabet by ‘drag and drop’ each name up or down but it seems like drag and drop is unable in Favorites panel. Hope this feature can be allowed in future version. The feature for order folders is always present in the Project Manager. Thank you! My bad! 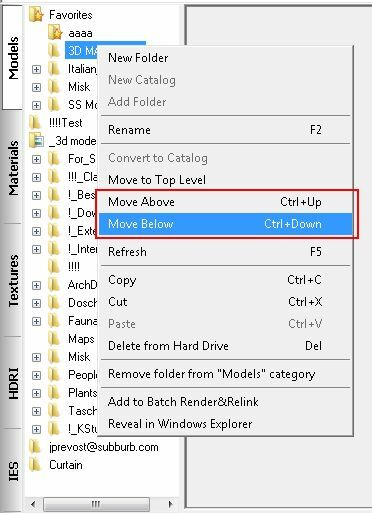 Forgot the ‘Move Above’ and ‘Move Below’ in right click menu… was trying to drag and drop..
Strangely, I am using version 2.10.36, but I am missing some shortcut keys like F2, Ctrl+Up, Ctrl+Down and F5 compared to yours. Fixed the some minor issues with saving the models. Fixed the some minor issues with plug-in hotkeys. Fixed the some minor issues with checking for update the utility. Fixed the issue with setting the size of the thumbnails when rendering the preview. Fixed the some potential issues. Turn on the option “Check for updates” for receiving the information about the new versions.